Certificate of level 1 ,2 or 3 from the European Football Association that is an intensive coaching course with practical assessment and tests a coaches deep knowledge and understanding. A coach needs a considerable amount of professional development to continue their coaching license with the FA. These qualifications should be on display or should be available to view. Visual cues – using demonstration, using color cones, hand signals to name a few. Practical activities where students are getting as much practice on the skills as possible. Correcting mistakes is vital as it gives students feedback and helps them understand how they can achieve a skill. Questioning – During the session look and see if the coach stops the play and asks the players open-ended questions. This type of questioning supports problem solving skills that help in their understanding of the skills and game. Unfortunately some coaches form bad coaching habits where they only direct kids to pass, shoot or follow the drill. This does not help students to learn and can lower the confidence of the child. Too many closed questions are also not recommended as they only allow players to have a right or wrong answer that can also lower confidence. Coaches need to have good communication skills with players and ask questions that help the student to learn and think through their answers. For example a coach should be in communication with all players asking him/her where to move if his friend received the ball or where a better position may be for a player to go. A good coach should help the players to understand why they should move to this position or part of the field and when they should pass etc. Decision making – The coach needs to let the students learn how to make decisions. The most important part of football is to let the player learn to make the right decision and let the player understand why it’s the best option. Let the player think about different situations and solutions. Living in the heat of the UAE the facilities are very important as there is normally 6 to8 months of hot weather as well as the many sand storms we have. A football academy in Dubai and Sharjah needs to have indoor and outdoor facilities where sessions can be run depending on the weather. We are lucky at the Star Football Academy as we have a big indoor Gym, and we have 3 outdoor football fields. Equipment is also important such as different types of balls, co-ordination and agility equipment and bathroom facilities close by. Friendly games allow players to use their problem solving and football skills with their team. Every player should be given the opportunity to participate not just the best players on the team. Every child that enrolls in the Star Football Academy is given the chance to play in every friendly game as it supports the development of the student. Many youth academies advertise their successes and their achievements; however this can be very unethical as when they participate in games they choose the best players to represent their academies in tournaments and have even been known to bring other great players to play with their academies in big tournament so they can win. This does not give the child self-worth and equality in the team or a chance to develop their skills and confidence. Winning should never be the scale of a good academy or a good coach. When I was working four years ago with Mr. Albert, the legendary coach that developed all the Barcelona generation he told players and coaches at the Al Wasel club in Dubai that he wasn’t interested in results and that he was more interested in the players that learned progressively and that after five years from the youth academy are playing in the first team. Interestingly in most European countries there are no league tables the only way to know the score of a game of a team that an academy will play against the following week is to call the team yourself as there are no league tables. The pressure of performance and winning has shown players dropping football. 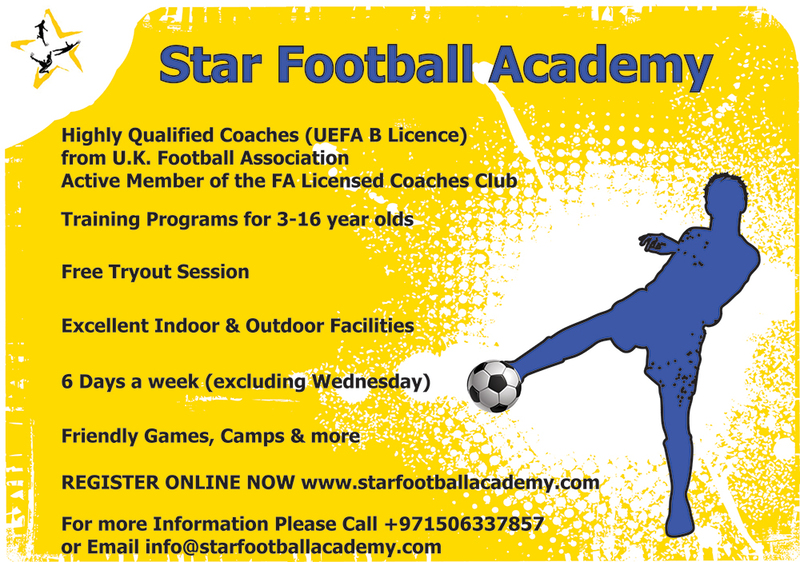 At the Star Football Academy it is simple for us we encourage all players to participate in every game. If we win then it’s great if the other team wins we congratulate them. We focus more on team performance and how as a team we played a good system and worked together rather than focusing on an individual player to shine in the team. After all these things have been considered you will have a more confidence in choosing an football academy in Dubai and Sharjah or wherever you may live in the future that best suits your child. Finally the best Football Academy cares about the whole child that is outside the game of football. At the Star Football Academy we want your children to look back many years later and have fond memories of their experiences in our academy and to learn lifelong skills that they take with them to their future lives and throughout their achievements.